The golden beach of Hawke’s Bay is a favourite picnic spot for those who have no alternative but to live in Karachi. It truly is a blessing and the only opportunity to get away from our mundane routines. 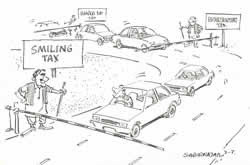 For many years now, a toll tax is being collected from vehicles going to Sands pit or Hawke’s Bay. I remember when the receipts clearly stated the amount as well as the name of the authority on whose behalf the tax was being charged (for example, Manora Cantonment Board). Yesterday, however, I looked at the receipt bearing the words “Sandspit/Hawke’s Bay/Manora Entertainment Fee”, without any amount stated on it. Not wanting to create a ruckus, I paid without protest, and proceeded further, turning right towards Hawke’s Bay without finding any evidence of entertainment being provided by the tax collector (unless you call the sight of malnourished goats and children entertainment). A couple of kilometres down the road, there was another collector, claiming to collect tax from those wishing to go to Cape Monze or French Beach. This time I had to be firm. I told him that I had already paid once, and since I was still in Hawke’s Bay, he had no right to ask me to pay. It’s obvious that these unscrupulous people are minting thousands every year without paying anything to any government body or cantonment board. The authorities should investigate and arrest those involved.